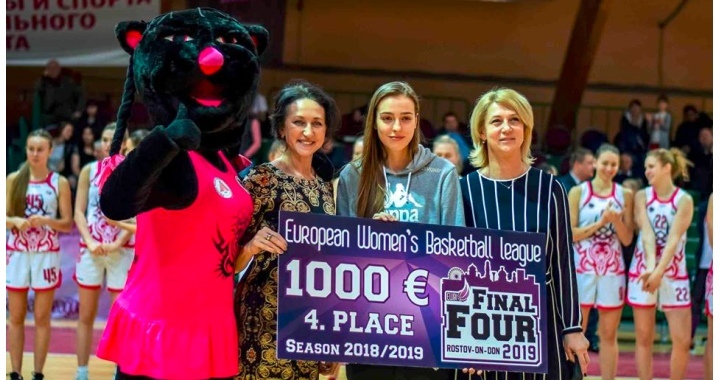 BY DAN DONOVAN | After our victory in a 2 game playoff series with A3 Basket back in February, we qualified for European Womens Basketball League Final Four which took place this past weekend in Russia. In our first game we played TTT Riga, a team from Latvia, at noon on Saturday, March 16. We started the game well and jumped out to a 20-16 lead after the first 10 minutes. Nikola Dudasova put up 8 points in the first period, including two three-point shots. In the second period we played well again and extended the lead to 9. We held the lead for the entire quarter and whenever TTT Riga would get close we would pull away a little bit. Unfortunately, we could not pull away enough to put TTT Riga out of the game. Our opposition started the second half strong with a 7-0 run, cutting our lead to a slim 2. Once the game got this close, there were two ties and different times where the lead changed. After 3 quarters, we were losing 58-53 with 10 minutes left to play. Throughout the fourth quarter we constantly got close to retaking the lead, even tying at the game at one point, but TTT Riga kept getting big baskets in the fourth. With 32 seconds left and the all, TTT Riga stole the ball from us and it turned into a game decided by free throws. TTT Riga made both free throws and we lost the ball again on the following possession and wound up losing 70-80. Even though we lost, 5 of our players scored double digits. Katerina Zohnova had 10, Beata Adamcova had12 Marques Webb and Nikola Dudasova had 13 and Michaela Vackova had 17 points and 10 rebounds. This meant that we were going to play in the third-place game against Rostov-Don-SFEDU, a team from Russia. The third-place game occurred that Sunday at 10 am and like the previous game, we started out very well. We started the game on an 8-0 run in the first two minutes and it looked like the ladies were ready to redeem themselves for the previous days’ loss. However, Rostov stormed back to take a 21-19 lead into the second quarter. It was a competitive, back and forth for the quarter, but Rostov steadily grew the 9-point lead which they held at halftime. We came out strong and performed well in the third quarter, even taking the lead with a three-point shot from Petra Zaplatova with a little over 2 minutes left in the period. However, Rostov was able to retaliate and took a 1-point lead into the fourth quarter. Unfortunately, after performing a steal with 18 seconds gone in the quarter, Petra Zaplatova sprained her ankle and could not return to the game. Not too long after that, with 7:44 left to play Katerina Zohnova got a broken arm and could not continue either. The loss of those two players proved key as we held a one-point lead before Zohnova was hurt, but we wound up losing by 9. Even though we lost and 2 of our players got hurt, Marques Webb had a fantastic game as she put up 19 points and had 17 rebounds, with 6 of them being offensive. This unfortunate turn of events had us finish fourth in the EWBL tournament. 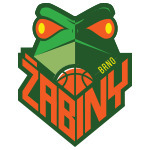 Looking ahead, we will play the winner of the KP Brno and BLK Slavia Prague series in the ZBL playoffs on a day yet to be determined.